Did you know there are almost 45 million dog owners in the United States with almost 63 million dogs? How about over 31.5 million dogs receive Christmas presents every year from their owners? Your furry friend deserves to celebrate the holidays too! Spread some holiday cheer in your dog's direction with a Dog Holiday Gift Basket from BisketBaskets.com. These gift baskets are beautiful and filled to the brim with your pooch's favorite treats and snacks, making it a wonderful gift for your best friend this holiday season. 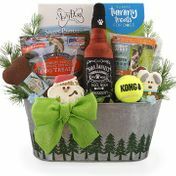 BisketBaskets.com has Dog Holiday Gifts that are something to bark about!